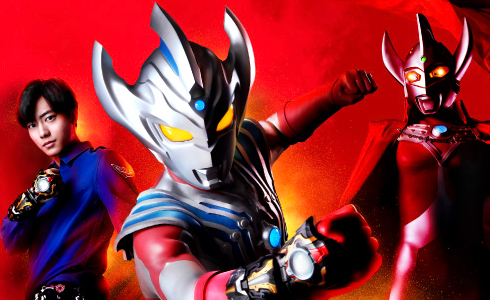 It's a recap and explaining the history of interaction between Sougo and Sento. With likely other implied details in various wordings. So it's a recap and hints of what's to come and how it's tied to the Build Ride Watch. Hence why the picture positioning is also surrounding the ride watch with Zi-O holding it out with emphasis. Because that's the emphasis of the page. Even not reading what it says, you can tell a lot by picture positioning. That's the way they do their media in general(print and motion) to heighten awareness and get the point across farther to make it more apparent and obvious at even a glance. So before a word is spoken or read, you get a rudimentary understanding of the implications. Like how Uhr and Ora's pictures are by their respective combined Time Majins, but also lack Ride Watches. Showing those are likely unique to them and not Zi-O or Geiz as yet. With their media and marketing, every detail matters to sell the concept or idea or build hype/excitement. Yup. When Uhr was trying to stall Zi-O before. Though iirc, all we saw was Uhr's captain ghost, not the revelation that it can combine to a Time Majin or that the time jackers have their own Time Majins. That and Geiz in episode 1 are also when we see the Ride Watches impact theirs. That their normal Ride Watch is why it has their faces, so it was rather expected that Ride Armor ride watches could enhance the Time Majins too. I think they even implied as such in toy scans and announcement stuff. But right now at least, Zi-O, Geiz, and any other riders(Woz potentially being an exception that has access to all), only get the ride watch enhancements. While Time Jackers get the wider equipment style. Though as with any show, that can always evolve later too. It looks like the style of it is relatively cross compatible for easy retools and additional enhancements. Last edited by Librarian; 10-29-2018 at 08:09 PM..
Well according to leaks Team Baron will appear, which could mean Kaito and Zack would be guests. Still unknown about Kota, although judging by the surprise announcement of Eiji and Hina returning a week before the OOO episode it could be possible. I was initially bummed that Eiji won't appear in the OOO arc due to how Kuroto dominates the guest spot. Something else interesting here is the Zi-O working with himself pics. If he is indeed crossing his own timeline to support himself, and it almost looks like Woz is in some of those pics too. Could this be foreshadowing an even more growing rift between Tsukuyomi and Gates/Geiz to Sougo? Like to the point he's now going so far as to cross his own timeline to support himself? Could this be more Woz pushed ideas? Really curious how that's going to play out. Woz is pushing more and more to try and make Oma Zi-O happen like it's supposed to, but also doing it in ways that seem very innocuous. He doesn't seem to be actively forcing it, but gently nudging in subtle ways to make sure it happens as it did. I think you're giving Shimoyama way too much credit here. This is from the same guy who wrote Ninninger by the seat of his pants IIRC. The Gaim transforming ride watch makes me think we might see Watermelon arms for the Time Majin/Mazin. Didn't get around to watching episode 9 until today, and the foreshadowing of the Hawk ride watch with these scans and the preview, along with their showing the Gaim green transforming one here but not what it does makes me think that might be a later surprise upgrade for the Time Majin/Mazin. All shows are written by the seat of anyone's pants. But the producers are keeping him on point. He does fantastic work when he's passionate about it, and the design producers stay on board. Nin had other issues that aren't his fault, and he made best do with what he had. One of the design producers kinda jumped ship on that one very early on(but kept signing off on the checks), and really only phoned in the concepts to begin with, including quick bench marks and cameos to toss in. How the crew and other producers made it work with what they had is really fantastic considering. A lot of shows have kinda had that though too tbh. Gaim was even more free reign and it came out fantastic. So nin was kinda in that middle place of too many stipulations, not enough freedom, and not enough of a worked out plan. But for what they had to work with, they did really well. Every so often there's one of those "F U BoA/Saban" seasons to blow off steam. Nin was one of those. Toq, and Zyohger are too. Which is ironic in other ways considering BoJ & Toei are who signs off on different things and pushes it forward. Nin in particular was built on attempting to simplify some concepts for kids as well. And all around was more quirky design emphasis with entire chunks that had to be cut from the final product. BoA and Saban had already lost influence at that point because of how the market share in their markets were dropping. Ninja Steel was their last hurrah so to speak, and so they tried to throw in some big things for fans like the oversized Lion fortress and a few other things. Like at one time there was supposed to be more Kaku stuff interwoven in too. When you end up with a cowboy ninja that has a hamburger morpher and a mecha type that's a throne within a throne, you can kind of immediately tell this is a steam blowing off season that's not meant to be taken seriously. So nin's problems I don't blame on the writer at all. He did the best he could with what he could. In many ways, Ninja Steel suffers from this too. It had basis to grow to become bigger nods, but the dwindling market share and other issues held it back a bit more because the passion wasn't there, though the creative teams still gave it their all. They are supposed to be more outlandish campy throwbacks and not to be taken seriously at all. *Shrug* So I blame that prelim concept design producer more than anything, but then again, that same design producer has given us a lot of good stuff too over the years. So whatever. I mean this is the same area that's given us stuff like Blade, Hibiki, Kabuto, Den-O, Kiva, OOOs, Gaim, Gekiranger, Bouken, Magi, Lupin, Akiba, Amazons, First, Next, Build, go-on, Go-buster, Kyu, and way too many more to list across the board. Since roughly Hurricane/Aba or so. So a few "oopsies" are kind of whatever. The upcoming Dragon Sentai is from the same area again(and some of what's coming after), and the next riders should be too unless they get bumped back again. You'd probably be surprised how many things you praise across different industries and also curse across different industries all track back to the same source. So I tend to feel it's really unfair to pin the blame squarely on Shimoyama's shoulders. Borderline mean really too when it was out of his hands and not his fault. Last edited by Librarian; 11-04-2018 at 01:27 PM.. I'm not sure production design speaks to all the most serious things wrong with Ninninger's scripting. (Although we can just blame Takaharu on the casting director and leave it at that.) I don't doubt it's a factor, but it's not the entire thing. By comparison, Zyuohger's villains were unbelievably flat until someone on the writing team dreamed up Bangray, and suddenly, the show was churning out some of its most interesting episodes. So far, Zi-O's Timejackers are failing to intrigue me. I get that we're in the early, mustache-twirling section of the show, but we're seeing essentially the same scenes reiterated over and over, and it's giving me unpleasant Wizard flashbacks. So far we've got new info or development for the villains in every arc. The first three each introduce a Time Jacker, in the last one we learned that Geiz shares a past with them and Woz and in this one we have them talking about how they had been making bad choices for Another Rider and changing their methods. It's kind of thing that could suddenly stop, and leave us with random Another Riders again in spite of what they said this week, but that hasn't happened yet. Last edited by NeonZ; 11-04-2018 at 05:57 PM..
By comparison, Zyuohger's villains were unbelievably flat until someone on the writing team dreamed up Bangray, and suddenly, the show was churning out some of its most interesting episodes..
You can also fit the villains in LupinPat in that same category, infact I feel like Dogranio is essentially Genis 2.0 where he just sits and drinks wine all day. When it was announced that the writer for LupinPat was the same as Zyuohger, I knew what I was getting into, where it's mostly filler and not a lot of plot progression until the very end. I know Kyuranger is not everyone's cup of tea, but I enjoyed it more than LupinPat since it has a progressing plot, the characters (though not all, but understandably when the show has 12 rangers) get more fleshed out and the major villains are more active.